Those following the Obama Administration’s legal challenge to Arizona’s SB 1070 have likely heard about “preemption”—the legal concept governing when state laws conflict with, and are therefore superseded by, acts of Congress. The heart of the dispute over SB 1070 is whether states have a right to provide assistance that the federal government does not want. No one knows if or how the Supreme Court will ultimately answer that question. 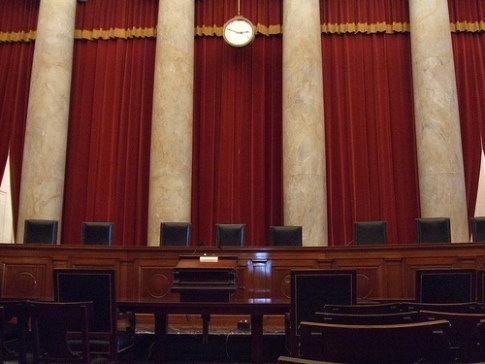 But a number of hints may emerge when the Justices issue a ruling in Chamber of Commerce v. Whiting, a case testing the legality of a different law known as the Legal Arizona Workers Act. Passed in 2007, the act imposed new requirements to prevent employers from hiring unauthorized workers, as well as harsh consequences for doing so. While the Justices’ questions during Wednesday’s oral argument offered reason for hope among immigrants’ rights advocates on one part of the law, they left the fate of the other unresolved. In the event of a 4-4 split, the Court would automatically affirm the decision below, which upheld Arizona’s employer sanctions scheme. But because no side would receive a majority, the decision would not be binding in future cases. Thus, if Justice Kagan agrees with the sentiments of her liberal colleagues, who seemed inclined to strike down the provision, Arizona’s technical victory could be overruled in any future case in which she participates. Such an opportunity could come as soon as next term. Back in September, a federal appeals court in Philadelphia struck down a law enacted in Hazleton, PA, that also included controversial employer sanctions provisions. Earlier this week, the town’s attorneys—including the infamous Kris Kobach, who also authored SB 1070—filed a petition asking the Supreme Court to overturn that decision. Since the Justices are clearly interested in the issue, it’s quite likely they will take up the suit against Hazleton’s law if the Court cannot muster a majority in Wednesday’s case. If that happens, a “win” for Arizona in the short term could quickly become a loss in the long run.